In reality, the proverbial “blink of an eye” lasts only a tenth of a second, but that’s all the time needed to clear away dust particles and spread lubricating fluids across the eyeball. Every time you blink, your eyelids spread a cocktail of oils and mucoussecretions across the surface of the eye to keep your globes from drying out.Blinking also keeps eyes safe from potentially damaging stimuli, such as bright lights and foreign bodies like dust. So why don’t you notice the world plunging into darkness every two to ten seconds? Scientists have found that the human brain has a talent for ignoringthe momentary blackout. The very act of blinking suppresses activity in several areas of the brain responsible for detecting environmental changes, so that you experience the world as continuous. We all blink. A lot. The average person blinks some 12-15 times per minute— so frequently that our eyes are closed for roughly 10% of our waking hours overall. Although some of this blinking has a clear purpose — mostly to lubricate the eyeballs, and occasionally protect them from dust or other debris — scientists say that we blink far more often than necessary for these functions alone. Thus, blinking is physiological riddle. Why do we do it so darn often? In a paper published in the Proceedings of the National Academy of Sciences, a group of scientists from Japan offers up ananswer to this — that briefly closing our eyes might actually help us to gather our thoughts and focus attention on the world around us. The researchers came to the hypothesis after noting an interesting fact revealed by previous research on blinking: that the exact moments when we blink aren’tactually random. Although seemingly spontaneous, studies have revealed that people tend to blink at predictable moments. For someone reading, blinking often occurs after each sentence is finished, while for a person listening to a speech, it frequently comes when the speaker pauses between statements. A group of people all watching the same video tend to blink around the same time, too, when action briefly lags. As a result, the researchers guessed that we might subconsciously use blinks as a sort of mental resting point, to briefly shut off visual stimuli and allow us tofocus our attention. To test the idea, they put 10 different volunteers in an fMRI machine and had them watch the TV show “Mr. Bean” (they had used the same show in their previous work on blinking, showing that it came at implicit break points in the video). They then monitored which areas of the brain showed increased or decreased activity when the study participants blinked. Their analysis showed that when the Bean-watchers blinked, mental activitybriefly spiked in areas related to the default network, areas of the brain that operate when the mind is in a state of wakeful rest, rather than focusing on the outside world. Momentary activation of this alternate network, they theorize, could serve as a mental break, allowing for increased attention capacity when the eyes are opened again. To test whether this mental break was simply a result of the participants visual inputs being blocked, rather than a subconscious effort to clear their minds, the researchers also manually inserted “blackouts” into the video at random intervals that lasted roughly as long as a blink. In the fMRI data, though, the brain areas related to the default network weren’tsimilarly activated. Blinking is something more than temporarily not seeing anything. It’s far from conclusive, but the research demonstrates that we do enter some sort of altered mental state when we blink — we’re not just doing it to lubricateour eyes. A blink could provide a momentary island of introspective calm in the ocean of visual stimuli that defines our lives. Why you should blink more? Ever find that your eyes have an irritated “scratchy” feeling after a long sessionusing the computer? A relatively normal blink rate is 12-15 blinks per minute, but computer users tend to blink much less frequently, more typically around4-5 blinks per minute. Why? The eyes normally jump around the screen in pattern called a “saccade.” Blinkingdisrupts this pattern and lowers productivity for someone concentrating on an intense visual task, especially when under deadline to get a big project done.Blink less and you get more done… but it can take a toll on your eyes. A dry, scratchy sensation is a common symptom of dry eyes. Interestingly, insome cases, computer users actually suffer watery eye symptoms due to the fact that the eyes are irritated but the reduced blink rate doesn’t spread thetears effectively. In conclusion: As we stare at the computer screen or while reading, our blinkrate decreases. We actually blink 66% less while working on the computer. This can make your eyes burn, dry out, turn red or feel itchy. Before I start to explain about the 3 types of tears I want to share with you thisvideo. It’s about a girl named Iris. Sounds familiar? Crying is so innate, we produce 10 ounces per day and 30 gallons a year. When it comes to gender, it seems more women compared to men are shedding tears. Women cry an average of 5.3 times a month, while men cry an average of 1.3times per month, according to a 2011 study published in the Journal of Research in Personality. Researchers believe this is because women are biologically wired to shed more tears than men, since female tear glands are much smaller than men’s. Regardless of gender, we actually all cry every second of our lives and produce the same types of tears. 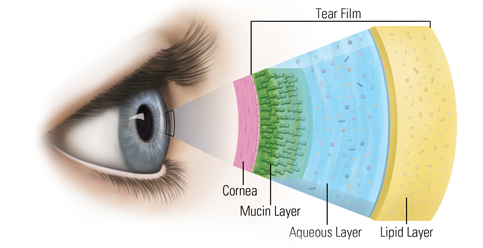 The lacrimal gland, located in the outer part of theupper eye, is constantly secreting a protein-rich, antibacterial liquid. This fluidgoes from the outer edge of the eyeball toward the cornea and lubricates theentire eye surface every time we blink. The crying we are all familiar with is when excess liquid overwhelms the drainsof the nasal canal of the tear duct, which overflows and falls down our cheeks. Basal tears are always in our eyes to serve the purpose of lubricating,nourishing, and protecting the eyes. Basal tears keep our eyes lubricated, which is important in preventing damage by air currents and bits of floating debris. The second type of tears, known as reflex or irritant tears, protect the eyes from irritants, including wind, smoke, or onions. Irritant tears (or reflex tears) are produced when the eyes are hit by wind or sand (or insects or rocks). Bothbasal and irritant tears have the same goal: protecting the eyes. Lastly, the third type are those that are produced by emotion. Although these tears contain higher levels of stress hormones, such as ACTH and enkephalin — an endorphin and natural pain killer — they can also work by directly calmingthe iris down while signaling the emotional state to others. Emotional tears are secreted in moments of intense feeling – sometimes joy, but more often sorrow. They contain stress hormones as a way of getting rid of them. This may be one reason that crying is therapeutic when we’re under a lot of stress. We’ve been crying since we were babies and will continue to do so for the rest of our lives, so even if we don’t always know why we cry, it’s nice to know the intricacies. How Iris reminds you to blink more?